The search for great haircare never ends. As I recently declared on Twitter, if I had a hair stylist with me at all times I guarantee my life would be 45% happier and 75% easier. Alas, I’m not Lady Gaga so I have to make do with doing my barnet myself. I’ve babbled on about my hair woes before many a time, so you’re by now familiar with my need for a shampoo and conditioner that straightens and conditions without weighing my hair down. The new range from Kerastase aims to make hair care simple, offering a pretty universal regime that aims to offer weightless shine and care. This pale pink pack is aimed at a slightly younger audience who may not be so familiar with the long-established French brand, but that doesn’t mean ladies such as myself can’t get a bit of the action. 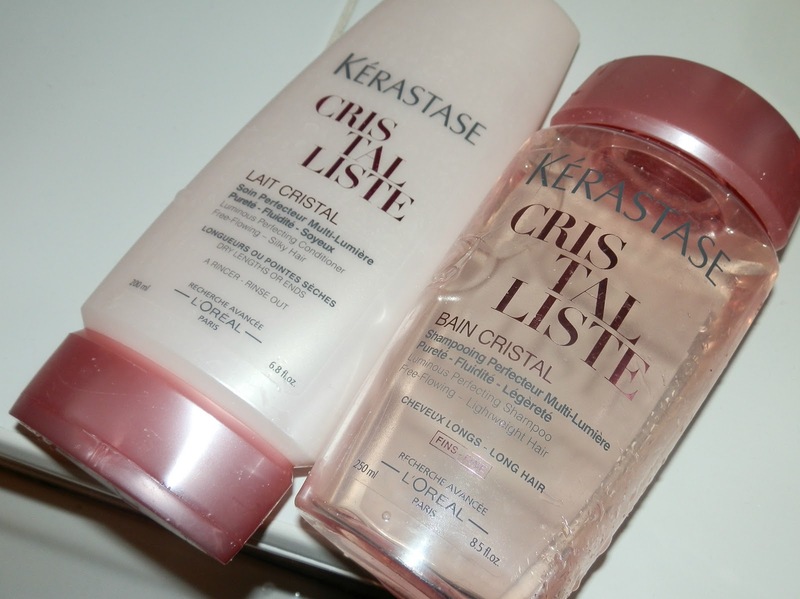 Within Cristalliste there are two shampoos (one for fine and one for thick hair) one conditioner and one serum treatment – it’s refreshing that you don’t need a degree in hair styling to figure out what products you need, because there’s only a choice of two. I’ve been using the shampoo for fine hair, which lathers particularly well and leaves hair feeling shiny and clean. There’s nothing spectacular about the basic shampoo, but it does detangle and clean without stripping the hair of moisture. Refreshingly too, the shampoo is clear and doesn’t really have a fragrance so you won’t feel like you’ve dipped your head in a Pina Colada after washing it. The conditioner is very very light, almost a little too runny, so you have to be careful not to use to much. A little bit does work really well though to leave hair feeling healthy and light, shiny and nourished without feeling heavy or weighed down. After blowdrying I noticed my hair continued to feel light, not flyaway, shiny and manageable without being too hard to style. In a word, this range allows your hair to reach its potential without over complicating styling or trying to treat any particular problem. What’s even better is that everything is a little cheaper than the regular range, meaning you can dip your hair into professional hair care without having to spend a fortune – this makes luxury a little more accessible. More details on the range on the website. Next Post Chubby Sticks are BACK!